The Cultural Heritage in CLEF 2013 lab comprised three tasks: multilingual ad-hoc retrieval and semantic enrichment in 13 languages (Dutch, English, German, Greek, Finnish, French, Hungarian, Italian, Norwegian, Polish, Slovenian, Spanish, and Swedish), Polish ad-hoc retrieval and the interactive task, which studied user behavior via log analysis and questionnaires. For the multilingual and Polish sub-tasks, more than 170,000 documents were assessed for relevance on a tertiary scale. The multilingual task had 7 participants submitting 30 multilingual and 41 monolingual runs. The Polish task comprised 3 participating groups submitting manual and automatic runs. The interactive task had 4 participating research groups and 208 user participants in the study. 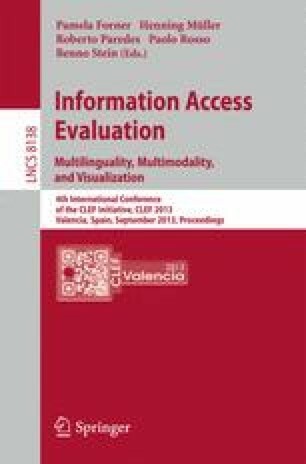 For the multilingual task, results show that more participants are necessary in order to provide comparative analyses. The interactive task created a rich data set comprising of questionnaire of log data. Further analysis of the data is planned in the future.